R&R Fascias are a fascia and soffit installation and repair company based in Porthleven in Cornwall. They also fit EPDM flat roofing and carry out external property repairs and maintenance. 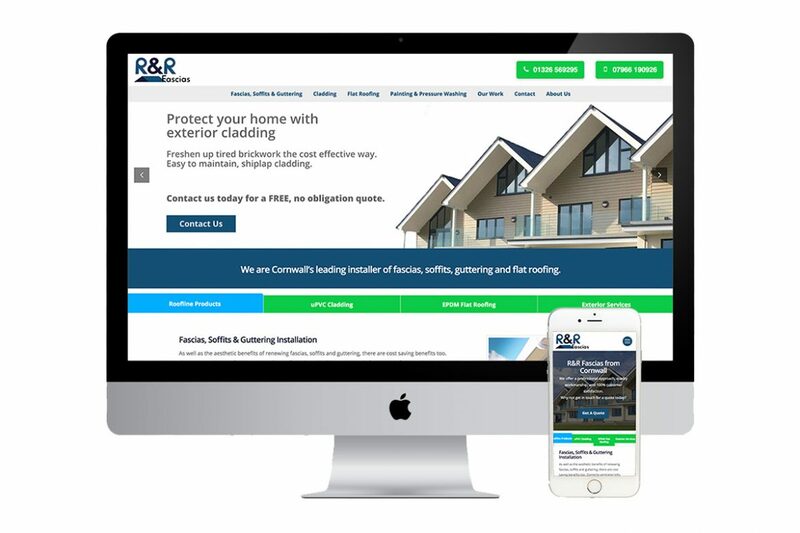 Robert Hichens, one of the owners of R&R Fascias approached me via an email to the website. I had been recommended to him by another customer of mine and was after a website for the business. Locally, around Porthleven and Helston, the company had a good name and was building a reputation for quality workmanship and good service. Although Rob was using Facebook to show off pictures of his work, he was requiring a countywide customer base to help expand his business. It was at our first meeting that I explained that a cost-effective way of expanding the name of the company was to constantly update his website with a portfolio fo the work he was doing. This would be a great way to create a strong SEO presence locally and help word to spread via the search engines. I built a WordPress site for the company with a portfolio section for him to add his own ongoing content. This content would feature a location address and require a description of the work to add the natural use of industry keywords to target a core audience around Cornwall.